Bigfoot, Texas was established in 1865 and is about 35 miles south of San Antonio. 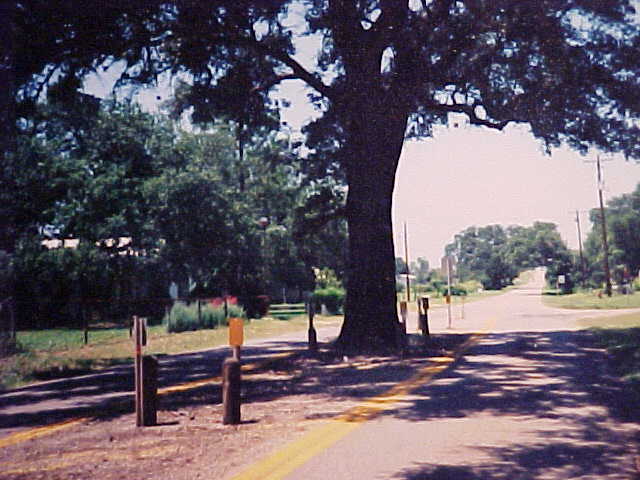 The historic "Tree" in the middle of road FM 472, is the unique landmark at the center of Bigfoot. The community is known for its hunting, farming and rural activities. Check out the page Bigfoot Wallace Museum for information on the famous Texas Ranger Bigfoot Wallace. While visiting this site you can keep up to date on current events by checking out the Community Calendar. Feedback or comments on this website are welcomed and can be forwarded via e-mail on the Contact Us page. Thinking of moving to the Bigfoot Community? Welcome! The About Us and Services pages will help introduce you to the local schools, geography, churches, utilities and other helpful information for newcomers. Visit our local Business & Sponsors who help to fund this webpage. A percentage of the proceeds are donated to local charities and help to maintain the historical Bigfoot Wallace Museum and Longview Cemetery. Just For Fun is updated frequently with pictures from current events, recipes and other fun information. Bigfoot Volunteer Fire Department is the page on the website with information about the local Fire Department.